New Steel Heavy-Duty Tops for Mule Pro FXT ! 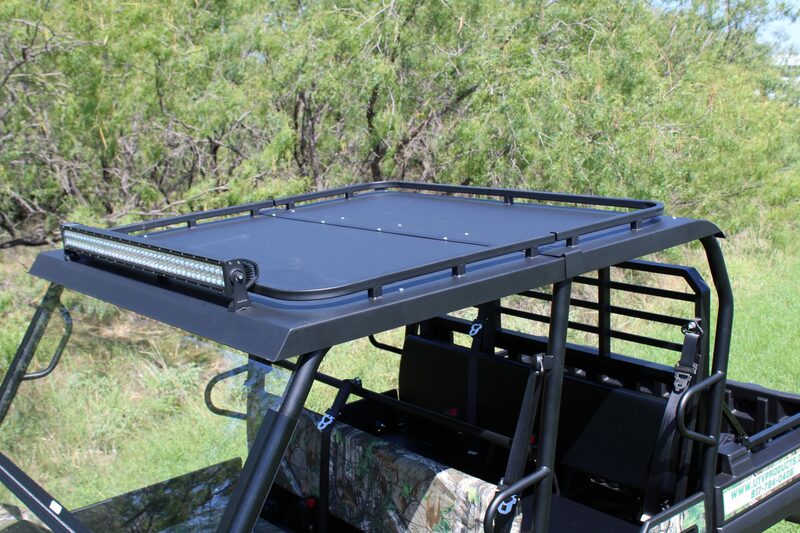 GR Manufacturing is proud to introduce our new HEAVY-DUTY steel hard top, for the Kawasaki Mule Pro FXT! Integrated railing / ladder rack is standard, along with powder coating to match the factory roll bars. *Light bar not included. This top is the premier FXT roof on the market! You can even haul feed, extra gear, or whatever you choose, by securing it to the railing. It's awesome! The World’s Best-Selling UTV accessories! 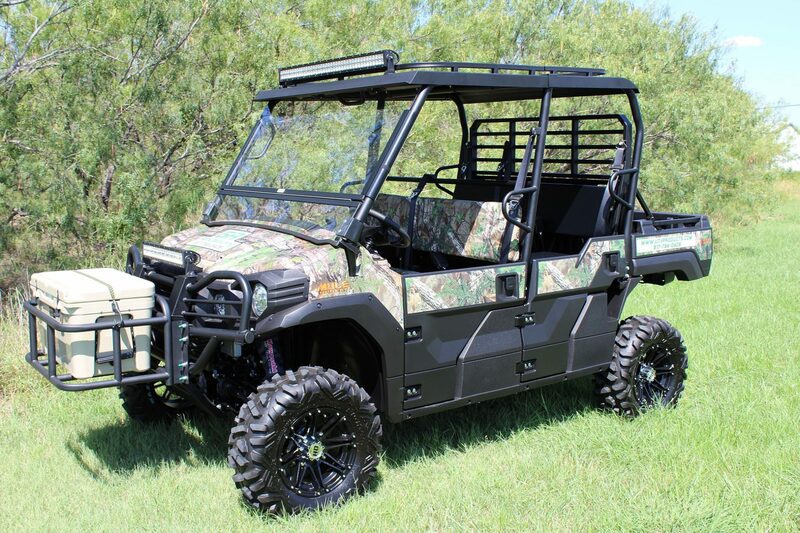 GR Manufacturing provides some of the finest UTV products in the marketplace, for the Kawasaki 3010/4010 Trans Mules, Pro FXT, 600/610 Mules, Kawasaki TERYX4, Polaris Ranger Crew, and for the Bobcat3400XL. We use a very strong grade of ABS plastic to form our hardtops. We also include a UV inhibitor into our plastic when the sheets of ABS are initially extruded, so the effects of sunlight will not adversely affect the products. In addition, look at the photographs of our hardtops: you will see numerous ribs, indentations, and a slight curvature to our hardtops. All of this is done to create a rigid final product, and to also make the top as aerodynamic as possible. The aerodynamics (even though these machines are not all that fast) helps to reduce the amount of dust that some machines will get coming in through the back of the machine. All of our tops feature a rain gutter all the way around the perimeter, indentations molded in for optional fog/off-road lights, and come standard with an LED wireless interior cab light. We model all of our products within a 3-D CAD computer program which ensures that our final products will fit the machine perfectly. We only make custom-fit products, and none of our parts are ‘universal’ like some of the UTV parts you find at the large box retailers. We currently manufacture five different windshields: one for the 3000-series Kawasaki Mules, one for the 4000-series Mules, one for the 600-series Mules, one for the Kawasaki TERYX & TERYX4, and a version for the Mule Pro FX & FXT models. These windshields are only made from the highest quality components. We have our polycarbonate and acrylic ‘glass’ panels custom extruded, and custom cut on a highly accurate CNC machine. This ensures a perfect fit every time. We also have the plastic frame pieces custom extruded so that all components work perfectly together. In all models of our windshields, we use a stainless steel hinge to connect the two halves. This hinge is connected to our extruded plastic with aircraft rivets for maximum strength. All windshields are hinged for multiple reasons: to allow for ventilation while riding in a hot climate, to allow access to the front storage area under the hood (when applicable) and to be left in the open position for towing the vehicle on a trailer. We have towed the Mules on a trailer with the windshield installed (and in the open position), without any problems up to legal highway speeds of 70-mph. These are NOT universal windshields that semi-fit a multitude of machines. Our windshields are only designed to work on their specific applications. This is highly important to our design team, since we believe in a truly custom fit on every machine we make products for. Our tops for the larger machines (Kawasaki Trans Mules, Polaris Ranger Crews, and Bobcat 3400XL’s) will take about 45-minutes to install. Once you have installed one or two of our tops, the next ones will only take the technician about 30-minutes to fully install. The smaller tops (such as the Kawasaki 600/610 top) only takes about 15-minutes to fully install. We make the installation process painless, and include ALL the necessary hardware and instructions to complete the installation in a timely manner. Common hand tools are all that is required! Our windshields install even easier: in most cases they require NO tools and only take about 1-minute to install! The windshields for the Kawasaki 600/610 Mules are almost as simple, and only require about 5-minutes for proper installation. We try to make it simple! We custom-design all of our products with a CAD 3-D computer program. After ‘mapping out’ all of the geometry and rollbars of each machine, this allows us to extrude our products for a truly custom fit. Before any product is ever offered for sale, we thoroughly test all items before they are mass-produced. Having the highest quality products is vital to our business, and we will NEVER sacrifice quality in any product. Same Day Shipping & No Backorders! We ARE the manufacturers of our products, and not just a distributor. We try hard to keep all of our products in stock at all times. Our reasoning is simple: with dealers all across the country, some areas of the country may be booming with seasonal business, while others may not be. Since all areas of the country are different, we never really know who is going to need product, and when. Therefore, we MUST always try to keep stock in our facilities for immediate shipment. And in most cases, if you place your order by 1:00 PM, central standard time, your order typically ships out the same day! Also, by being centrally located in Fort Worth, Texas, shipping to most any part of the country is typically 3-business days or less. Kawasaki PRO-FXT STEEL Hard Tops: NOW SHIPPING! Kawasaki SX Mule Windshields: NOW SHIPPING! Kawasaki Teryx 2016 model windshields: NOW SHIPPING! Celebrating our TEN YEAR ANNIVERSARY! Thanks to all of our dealers who made this possible! Kawasaki Mule PRO-FX & FXT Lift Kits! The lift kit is a true 4″ lift, and offers 4″ of lift with stock tires! Over 2,000 3,600 now in service!!! AWESOME!